Connor moved up this season to U-10, meaning under-10, meaning I have to always remind myself what each grouping actually represents. Someone was talking to me about U-19 this weekend and I was all, ‘huh?’ We worked through it. 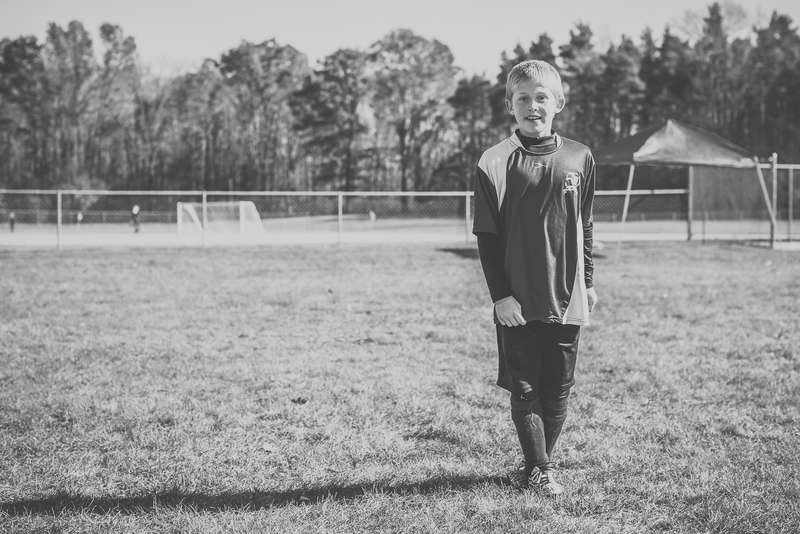 The really cool outcome of this season was the invitation he received to play in his first tournament. It was the first time he was on an all-boys’ team and man, were they fun to watch. The unfortunate part about the tournament was that it was last weekend. Have you ever heard the phrase, ‘polar vortex’? Just wondering. I mean, it was at least a balmy 28 degrees when we arrived at the soccer field at 7:30 last Saturday morning. I’m not complaining but the fact that it wasn’t light out made me question our race to get out of the house. I had decided that morning that I was going to be okay with the ridicule about wearing my snow pants and jacket and gloves and mittens and three layers of socks and leggings and hat. I simply cannot handle cold. Even with all of that, wait for it … I froze for a good portion of the day. Connor’s team was obviously cold the first game. Not cold like they weren’t ready; cold like, one player shared with me after the game that his foot was numb. They still played really, really well and tied. Connor scored the first goal almost immediately after the game started. The second game also ended in a tie. I sort of wonder if the ref yelling at me had anything to do with the outcome. She told me she knew what she was doing so I hear I lost our team the sportsmanship award. Sorry about that, everybody! But, I am thankful I yelled for play to stop when one of our players was on the ground his head just feet away from active play. But still, ref, you got this. The third game though? We lost. But. I was so proud. So ridiculously proud. Connor scored this absolutely beautiful goal that caused me to instinctively jump up and down and point both hands repeatedly at the field shouting, ‘that’s my favorite boy of all time’. Who says that? Oh yeah … this mom. Connor’s coach told us after that game that the outcome actually hadn’t mattered because they were already out of the running to go into the Sunday games. But that was one loss I would have watched a hundred times. The game was so exciting and so fun because our boys were just fantastic. They played so hard. They talked to each other and fought until the last whistle blew. At the end of the day, we stretched out on the couch (trying to warm up) and I just kept telling him how proud I was … how much I loved watching him play. He did his absolute best and I would never expect anything more. Win or lose. This entry was posted in the best part of me and tagged connor, fall, fun, memories, photography, proud mom by staci. Bookmark the permalink.